Once my sewing room gets tidied, I get seriously productive. This week, a dear friend told us he was getting married in January. Plenty of lead in time I know but I had an idea that needed to 'get out'. 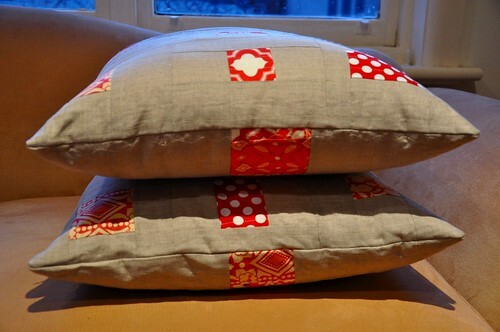 So I raided my red scraps bin and some beautiful linen, and made them some cushions for their couch. 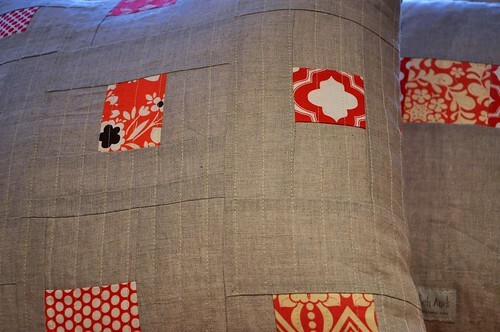 And quilted on both sides. I inserted invisible zips using this excellent tutorial. I wonder if I'll be able to wait until January before I give them!! Binding on a baby quilt that I haven't shown you yet. Tomorrow I have no 'proper' work to do and no kids in the house. I'll be stitchin' up a storm. These are just gorgeous and stylish enough to be sold in the coolest Melbourne homewares stores! I love the backs too. Your FB status made me FINALLY start quilting the huge quilt I've been scared of. Boy, you ahve been productive! 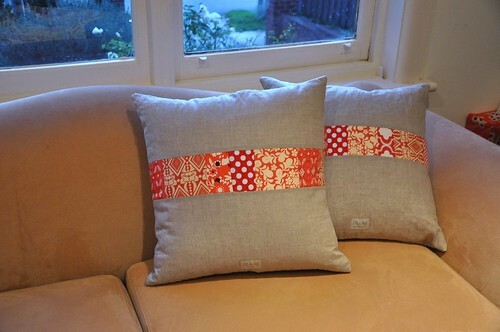 Love the simple stylish cushions. Tomorrow? Stitching and cooking and then some more stitching. Enjoy your day of freedom. Love how you've patched together that linen Andi. Where do you buy your linen from? Wow, I am impressed!! Such productiveness and beautiful too!! You are way ahead of the game as far as the wedding gift is concerned, good for you!! wow,,so ahead of the game. there'll be no stopping you tomorrow! Andi, I love your scraptacular mosaic quilt- the colors are beautiful and I bet those scraps tell some great stories too. 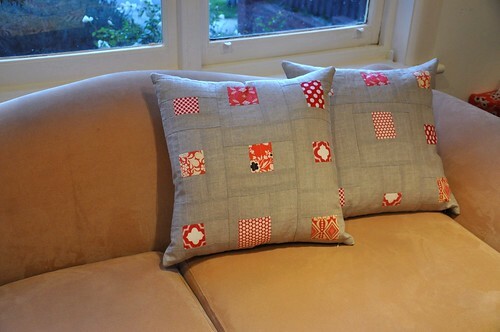 Your pillows turned out just terrific- thanks for sharing. Yes agreed lovely cushions especially the woven effect. In fact a stroll through your posts and some fantastic work.